Note that the walnut ink crystals should be dissolved in warm water. 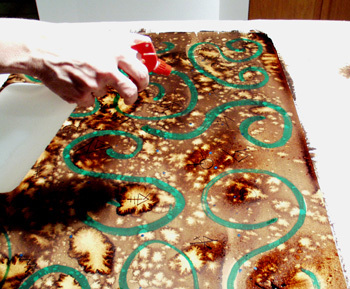 Make a fairly concentrated solution (which will be dark) because the process uses water to create lots of light areas. It is easier to lighten a piece after you have painted it, but more difficult to darken it if you have started with a very dilute solution. Printmaking paper (Rives BFK was used in this example, but Arches, etc. would also work well). Really absorbent watercolor paper doesn't work as well because it tends to absorb the walnut ink. What you want is paper that will allow the ink to move when water, bleach or a resist is applied. Water (a spray or squirt bottle to apply this with is also helpful to control the size of the "dots" that you get). Calligraphy ink or acrylic ink (if you want to make a design on the paper first; optional, but can add to the overall effect). See photos for step by step instructions. 1. 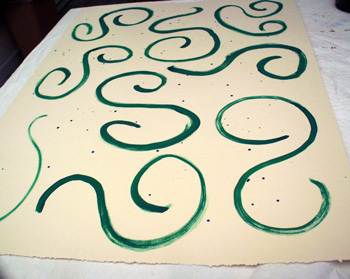 Rives BFK (cream) printmaking paper was painted with random designs and swirls with acrylic ink. This dried overnight. 2. Using a fairly concentrated solution of walnut ink and a broad brush, paint the paper. You may note that the walnut ink "pools" a bit around the acrylic ink. This effect is more pronounced with calligraphy ink. 3. Continue painting until all of the paper has been covered. 4. This is a close-up of the painted paper while it is still wet. There may be some darker areas but this is fine, in fact, it is preferred. 5. This is another close-up view of the wet paper. For this particular type of acrylic ink used underneath the walnut ink, it acted only as a partial resist. Some of the walnut ink could be seen on top of the acrylic ink. 6. Now this is the fun part! With water, you can spray, drip, squirt, etc. onto the painted paper while still wet. Here, Debbie has dipped her hand into a container of water and is "spritzing" the paper with the water. Note the lighter areas of water droplets. 7. This is another view of Debbie sprinkling water on the paper using a very wet hand. 8. This is a close-up of the paper at this stage. You can see that the water created a lot of movement in the walnut ink, creating lighter areas. We're not finished yet! There is still lots more that you can do! 9. Taking the end of a small paintbrush, you can write, draw, scratch, etc. marks into the still wet walnut ink. This will create marks darker than the background which adds a nice texture to the paper. 10. The marks that Debbie is making with the end of her paint brush are more visible in this shot. Debbie is drawing in some symbols. 11. Here you can see the darker lines created by drawing with the end of a small paintbrush. If you would like to create lighter lines and areas, you can paint with water to create lighter, controlled marks. You can also use bleach (this is better on dry paper). 12. Debbie repeated the process of drawing symbols in the wet ink throughout the sheet of paper. 13. 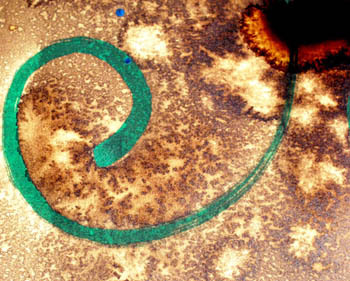 To create even more movement of the ink after the symbols were drawn in, Debbie applied more water with a spray bottle. It was applied only to certain areas of the paper where more pattern/movement was desired. 14. This is a close up of the not-quite-dry paper. 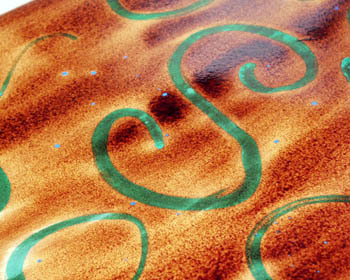 You can see the original acrylic ink design that was painted, plus the other textures created by application of various water techniques to the paper. 15. 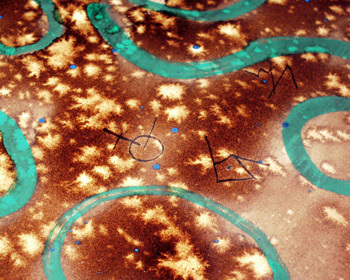 This is actually a sample of another paper that was created using bleach first as a resist (sort of) and sprinkling walnut crystals on wet paper to get the darker, more dimensional marks that you see here.